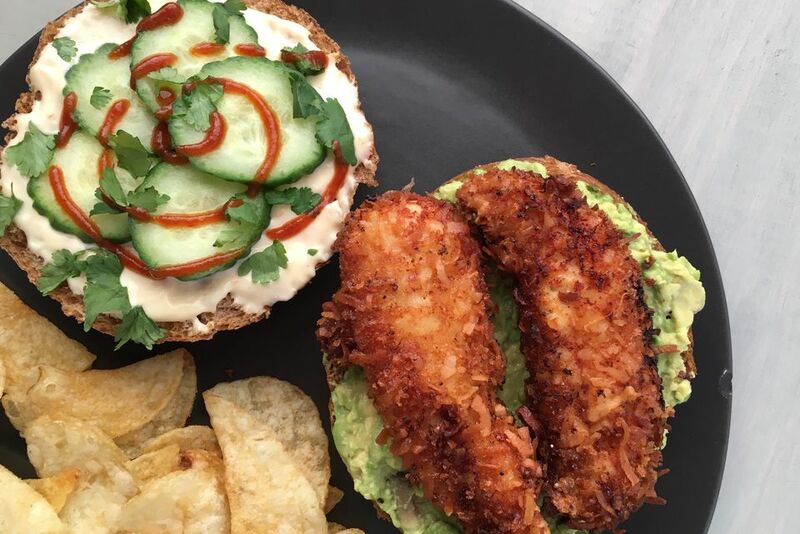 This tropical coconut fried chicken sandwich will transport you to the Caribbean without having to actually go anywhere. Made with a mixture of sweet coconut shreds and panko bread crumbs, this fried coconut crusted chicken is sweet, salty, crispy, and totally irresistible. Add avocado, cilantro, cucumber, Sriracha and homemade sweet chili aioli for even more flavorful! Meanwhile, arrange three bowls on the countertop. In the first bowl, add cornstarch and salt. In the second bowl, whisk the two eggs together. In the third bowl, mix coconut flakes, panko, and salt together. Once the oil is hot, dip each piece of chicken in the cornstarch, then the egg mixture, then the coconut-panko mixture. Shake to remove excess coating and place in the hot oil. In a small bowl, stir the sweet chili sauce with the mayo and set aside. Begin by toasting the multigrain bun. Once it's crisp, add the smashed avocado to one side and sprinkle with a little bit of salt and top with the coconut crusted fried chicken tenders. On the other half of the bun, add the sweet chili aioli, cucumber slices, Sriracha, and cilantro. Place the two halves together and serve immediately.